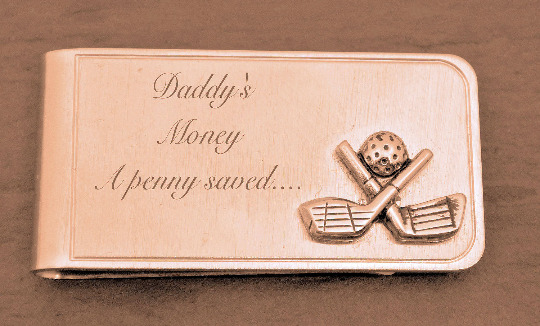 Engrave this elegant brushed gold golf clubs design silver plated money clip with a club symbol. This great looking money clip features a unique finger grip design that will hold bills securely. Add a special personal touch with the engraving of your choice at no extra charge including an elegant gift box. 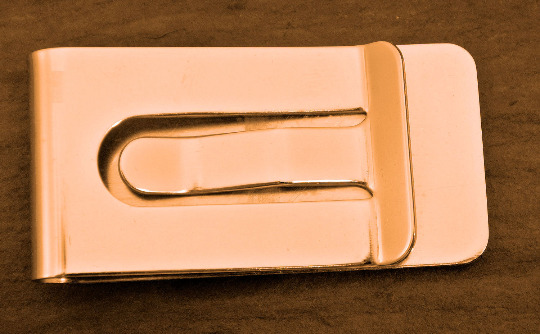 Our engraved money clips will keep your cash secure while maintaining a classy look. Whether you need some personalized groomsmen gifts or are just tired of carrying around an over-sized wallet these engraved money clips are perfect. We carry a large collection of high quality personalized money clips in several finishes and designs. All money clips can be personalized with engraving on either the front and/or backside.